Süka offers a unique approach to reducing the use of energy and generating sustainable electricity in domestic settings as well as public spaces. This is achieved by designing; sourcing and supplying Süka's solar energy generation systems with control equipment and providing training to local staff in order to help users take full control of their systems. We are experts of grid-connected and off-grid solar systems for homes and businesses. We offer most of the leading brands of off-grid solar predominantly of German TUV quality standards. Our company is an experienced intermediator between national and international manufacturers and wholesale customers; and we help drive cost down which translates to profitability for our partners. Our experienced and expert technical associates are always on the standby to give technical advice to customers on design, engineering and installation of small and medium sized photovoltaic systems. Public places like streets, schools, community centers, government buildings and parks as well as bus stop shelters can be easily and cost effectively lit by solar. Systems offered and deployed by the Suka Energy Group include Solar Street Lights, Community Solar Power, Solar Flood Lights and controls gear. 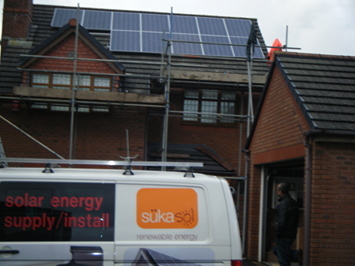 Solar pv for homes and businesses. Wind & Solar Hybrid systems known as solarmill. Control systems for cooling, moisture, air and motion.